Postcard HK-174627 from Hong Kong arrived today, showing Pink-speckled Shrimpgoby (Cryptocentrus leptocephalus), a rare, colorful goby with distinctive pink orange spots on the head. It is native to the western Pacific Ocean and lives in coastal reefs, lagoons, mangrove swamps and tide pools. In Hong Kong, it is only recorded in Hoi Ha Wan Marine Park. It usually inhabits sandy burrows dug by alpheid shrimps. 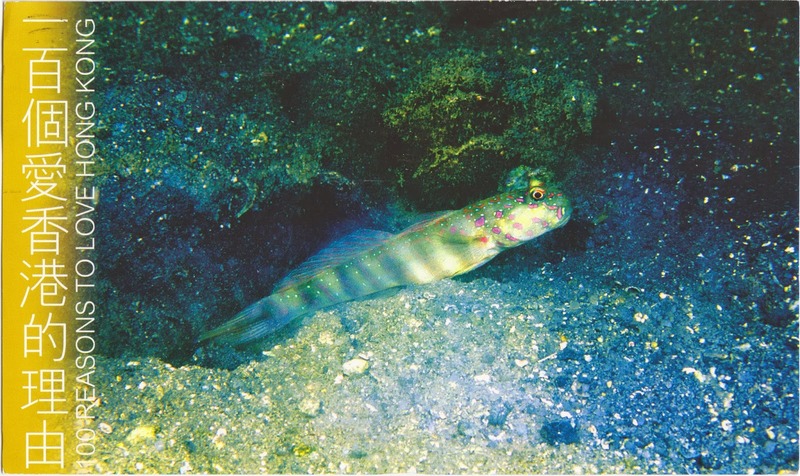 You can watch a video of the shrimp - goby partnership on YouTube. The postcard is one of "the 100 Reasons to Love Hong Kong" series. I am looking forward to more of those cards.